Just as Breitbart News predicted a little over a week ago, temperatures rising to the high 70s are causing an early spring snowmelt that is quickly filling Oroville Lake, causing the local sheriff to issue evacuation warnings for 11 areas downstream of the troubled Oroville Dam. Oroville Dam’s unstable and partially destroyed spillway has been closed since February 27 as dredging contractors at the bottom of the dam desperately try to carve a 1,500-feet-long by 150-feet-wide and 30-feet-deep emergency trench in the diversion pond to clear the Edward Hyatt power plant’s water intake pipes. Although heavy equipment operators have completed about 40 percent of the trench and opened two intake pipes that are now discharging 13,000 cubic feet of water per second, the water level rose in the last two days by 22 feet to within six feet of forcing an emergency reopening of the dam’s main spillway. Sheriff-Coroner Kory L. Honea has declared evacuation warnings for 11 zones in Butte County, including areas south of Lincoln Blvd for the towns of Oroville and Thermalito; all low-lying areas around the Feather River that include Gridley, Biggs, Yuba City and Loma Rica; and anywhere south of Butte County along the Feather River towards Sacramento. 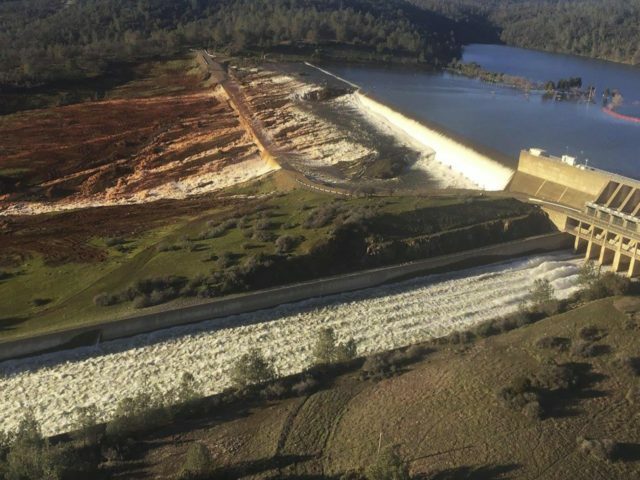 Due to the risk of a potential partial spillway collapse at America’s tallest dam on February 13, Sheriff Honea was declared a crisis and ordered a mandatory one-hour evacuation for 188,000 residents downstream from the dam. The Sheriff has promised that any future evacuation order would give residents 12 to 24 hours to flee. The National Weather Service is predicting that temperatures will jump from a high of 60 degrees earlier this week to an expected high of 78 degrees over the weekend, about 14 degrees higher than the average for this time of year. Then by mid-week, the Weather Service predicts a two-days of warm “Pineapple Express” monsoon rains will hit Oroville and the local mountains. The National Oceanic and Atmospheric Administration has rated over 90 percent of California as experiencing an “Extreme Water Year.” Although Merced is the only river that is currently above flood stage, numerous points and contributories along the Sacramento and San Joaquin are already in the warning stage. The California Department of Water Resources estimates that “snow water equivalents” for the California snowpack for this time of year are a near record 190 percent for the Central Sierras; June 157 percent for the Northern Sierras; and 186 for the Southern Sierras. Normally, the highpoint for California’s 24 major reservoirs and lakes is during the peak snowmelt in late May to early June. The water levels in all but three are currently rated as “extreme above” their historic averages for this time of year. The combination of a snowmelt and storms will create river flooding and could unleash flood waters going over the dams.